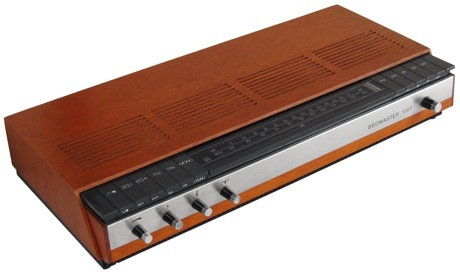 While the Beomaster 900 range had introduced transistors to the B&O mains radio range, the Beomaster 1000 was the first serious Hi-Fi receiver in the range that used them. Only available in one cabinet style, the Beomaster 1000 was dedicated to high fidelity reproduction, and included an FM-only radio tuner and a 2x20W stereo amplifier. 20W was a lot of power in the mid 60s, especially from such a compact and elegant unit. A notice was printed on the rear panel warning that loudspeakers could be damaged if they were not suitable for this level of output. Text copyright © Beocentral. Unauthorised reproduction prohibited. 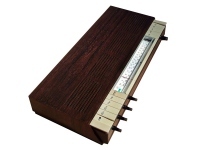 The controls took the “piano key” concept made popular in large European radios and re-arranged it into something new. The keys were placed along the top of the set and were marked with symbols on both the top and front, so that the set could be used on both a table and a shelf. As well as source selection, the keys also controlled two pairs of loudspeakers and filters for “rumble” and “scratch”. Two record players could be connected, initially both of the type with ceramic pickups, though an optional preamplifier could be fitted inside the Beomaster so that a B&O magnetic pickup could be connected directly. To complement the front key markings, a second miniature tuning dial was also fitted at the front of the cabinet. Text copyright © Beocentral. Unauthorised reproduction prohibited. The radio section, being FM only, was able to be focused on providing really good results. A stereo decoder could be fitted as an optional extra, the operation of which was displayed by a large green “stereo” lamp set into the dial. The action of the tuning knob was made smooth by the fitting of a heavy flywheel to its shaft. Text copyright © Beocentral. Unauthorised reproduction prohibited. The Beomaster 1000 received a major restyle and redesign late in its life. The main change was that silicon transistors replaced the germanium types fitted previously, though smaller detail revisions included the re-drafting of the printed circuit so that the magnetic pickup equalising preamplifier was part of the main assembly rather than being mounted on a separate panel. Along with these technical changes, the cabinet received some attention, most notably to the keys and dial surround which were changed from white to black. At the same time, the dial graphics were simplified and the small tuning dial along the front removed. The styling work was the first project at B&O for Jacob Jensen, a designer whose work would later become very influential over all B&O’s products. Text copyright © Beocentral. Unauthorised reproduction prohibited.